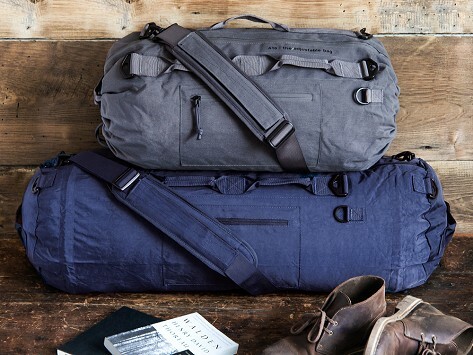 This expandable duffel bag can be every bag you might need. The convertible design grows from a day to weekend size, and then once more to suit longer trips. It can be worn three ways, too—on the shoulder, cross-body, or as a backpack. An adjustable cinch system is how this bag can grow and shrink. It can handle up to 90 pounds and is durably made to keep up with you, wherever you take it. Bought for a trip. Needed something to start small but able to expand for trip home. PIORAMA co-founders (and buddies) Simon Wu and Max Luett love to travel but don’t love some of the hassle that can tag along on a trip—hassle like an overstuffed bag. They created an expandable duffel bag to be the every-occasion bag you reach for, whether you’re heading to the gym or around the globe. The so-smart convertible design eliminates the need for multiple bags by growing or shrinking to suit what you need (and all your stuff). The secret to its transformation is its built-in adjustable cinch system. This makes it quick and easy to switch between sizes, even when you’re on the go. Besides working as an everyday, weekend, or vacation bag, there are three ways to wear it, too—backpack, shoulder, or crossbody. It’s durably built to keep up with you and can handle up to 90 pounds. When a bag makes heading out this easy, the hardest part will be deciding where to take it.